Croquetas de Jamon (P35/pc), is a welcome treat. 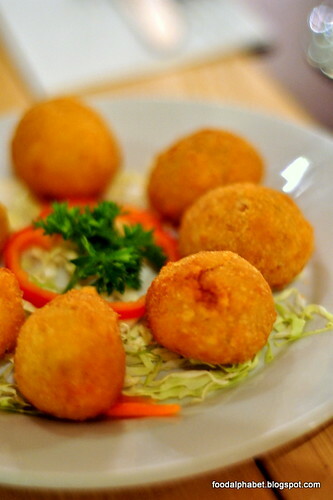 Crisp fried balls filled with creamy potato croquettes, every bite ends with a chewy and satisfying feel, inside you find ham bits with creamy potato filling, served hot and best consumed hot. I confess I consumed the whole plate ooops...I thought it was all mine, sorry for that. 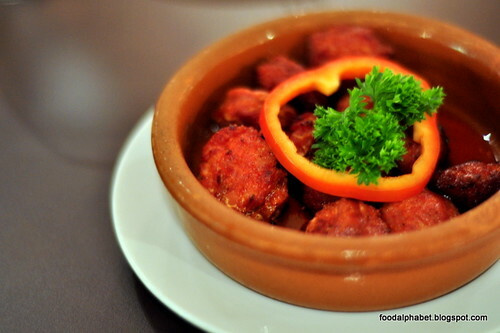 Another delicious and appetizing treat is their famous Chorizo Frito (P285), though it looks like ordinary meatballs in our sights, that will all change when you take a bite. A bursts of flavor comes to the senses with hints of spice, salt and meaty flavor. These chorizo pieces can surely capture every food lover's heart. Now on to the more filling stuff, what is Spanish food without paella right? 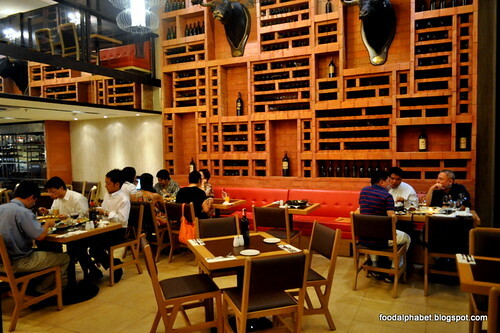 So in our midst is Paella Valenciana (P865) and below Paella Negra (P975). 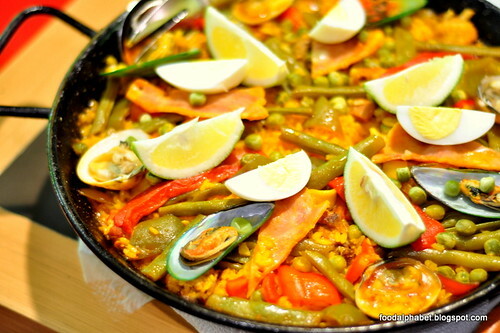 A mix of pork, chicken, seafood and vegetables over moist soft Spanish rice, most notably people tend to get the crisp part or should I say toasted rice on the base of the pan, as it adds more flavor to every bite. 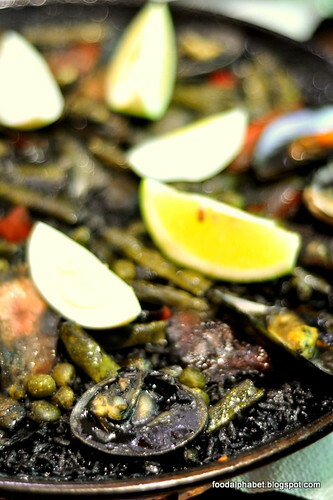 The difference with Paella Negra is that its cooked with black squid ink, it may seem too adventurous for some to try but it actually tastes good. Go give it a try. Asado de Pollo Ensu Jugo Plato Especialles (P1,130), now that's a mouthful. 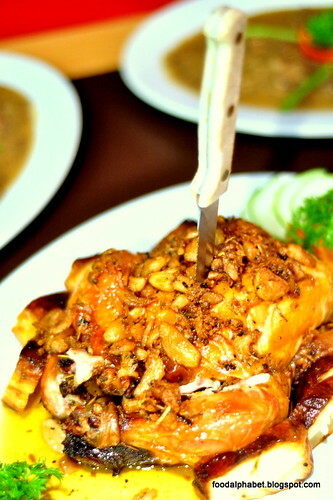 A special roast chicken, cooked for 4 hours before being served (so better call). Cooked to perfection, with a blend of roasted garlic, chunks of soft potatoes mixed with olive oil. Just the scent alone can you quite an appetite, soft off the bones is the term perfect for Casa Armas' version of Iberian chicken. 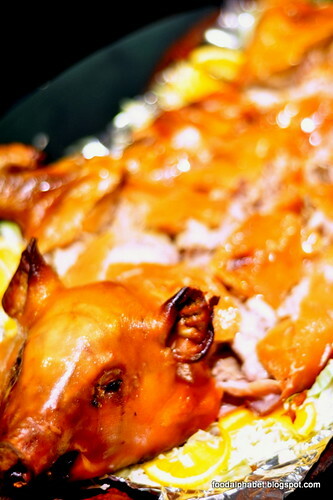 And the highlight of the evening was the Cochinillo al Horno ala Castellana (P3,995), a roasted succulent baby pig. 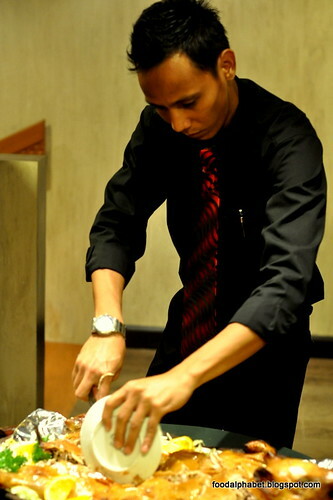 I was just enjoying my moment with the succulent pig, appreciating the sweet smell of meat, when one of the staff came in with a ceramic plate, I thought he was gonna cut it and serve and place on a ceramic plate but instead he made like its a knife and used this to slice open the pig with utmost precision and speed, evenly cutting down to the meat, like the way I do when I play Fruit Ninja, well kinda that is. Soft, chewy delicious meaty goodness, is the perfect description to this dish. You had me with you crispy skin. 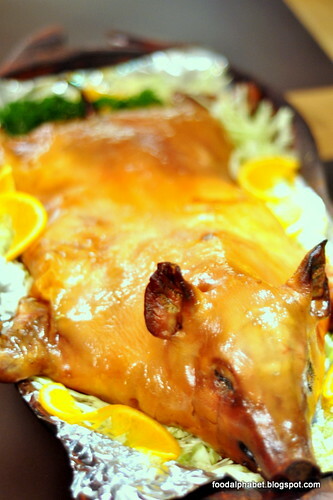 No need for sauces, the meat is packed with flavors and prepared fresh for 5 hours. 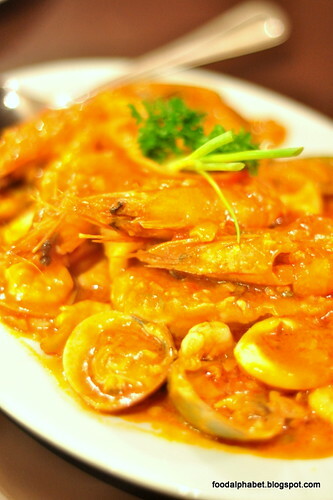 is a mix of seafoods sauteed in tomato sauce. 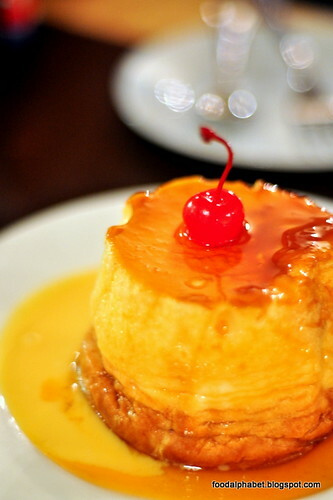 After a full meal, we have for dessert Canonigo Postres (P250), soft meringue cake with custard sauce. Even though I was so full, I just had to take a slice. It was really good and really sweet, one serving is good for 3 if you ask me, unless you are really into sweets. 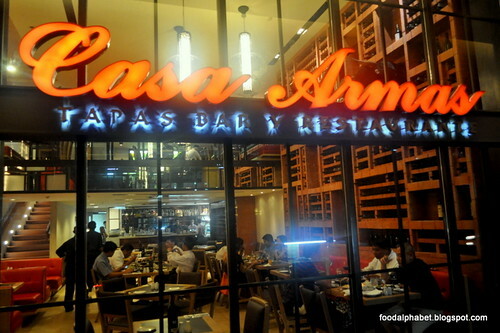 It was a great overall experience at Casa Armas in Greenbelt 2 Makati, even as years and generations passed by, they still maintain the quality and standards that make them a favorite dine-in spot through the years. 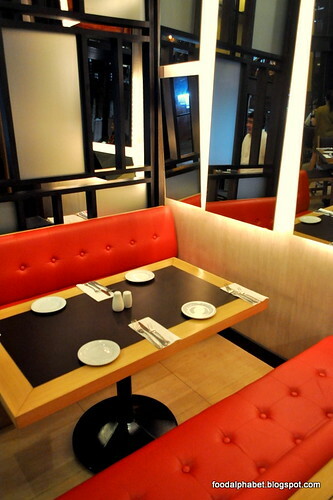 Enjoy dining.